Our WILLIAMSBURG and other Handmade Doormats are made from coir. Skip ahead for product details and sizes. 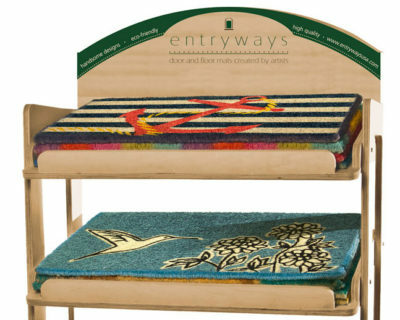 Entryways coir doormats are handmade by locals in Kerala, the most Southwestern state in India. This is a vital cottage industry, providing a fair and steady source of income and supporting a sustainable community. 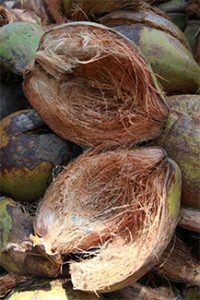 Coir comes from the husk of coconuts. It is a 100% natural and renewable fiber. The pictures above feature coconut husks before and after they’ve been spun. The coir is then hand-woven into a mat. 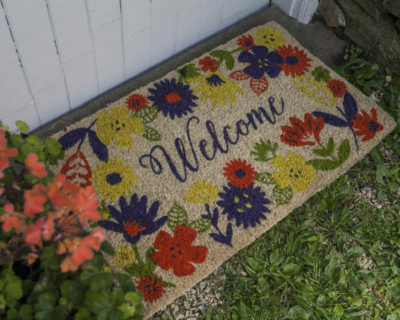 The dyes used for our doormats are fade resistant and eco-friendly. Each mat is hand-stenciled and dyed. After it’s made, each mat is then reviewed for quality. Our Handmade Collection is entirely made by hand, ensuring that your mat is of the highest quality. Made from the highest quality coir yarn, our doormats are stenciled with trendsetting designs. Our copyrighted designs are licensed from artists in the U.S. who are experienced in creating quality artwork, offering the popular colors and motifs of today. Best of all, our designs resist fading and running! Hand-woven in India, our 100% natural coir doormats are hand stenciled with permanent, fade-resistant, eco-friendly dyes.They are made for outdoor use, preferably under a protected area to prolong their life. F – Our best quality. Double thick, densely woven fibers, stenciled or woven designs. Available in three different dimensions 18×30, 18×47 and 36×72. They are 1.5 inches thick and weigh from 7.5 to 11 lbs depending on size. S – Stenciled on bleached coconut, these high quality doormats are densely woven and are ¾ inch thick. Available in 18×30 inches only. Weight: 3.4lbs. Mats in our Sweet Home Collection are made of coir with a PVC backing and feature beautiful designs like our original Handmade Collection. This distinctive Collection offers our customers beautiful design at a more affordable price. P – This mat is made of coir with a non-slip backing. These doormats are 17” x 28” and .5” thick. Each mat weighs approximately 4 pounds.